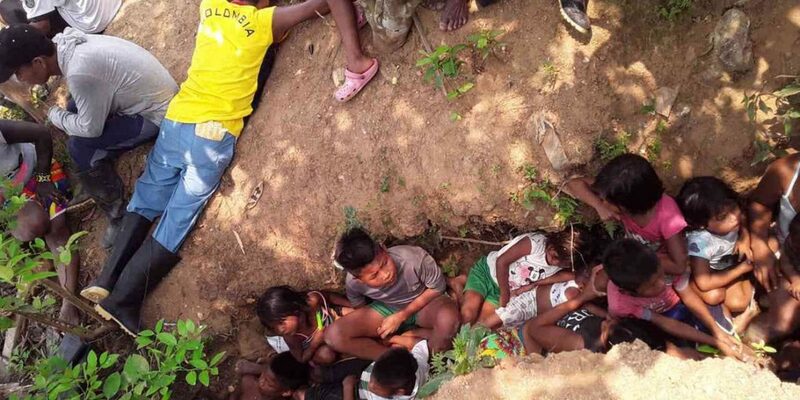 Children hiding in a ditch during combat in the west of Colombia. The International Committee of the Red Cross (ICRC) has confirmed that fear and armed conflict are on the rise again in a blistering rebuttal of the ruling party’s controversial denial of armed conflict. In an editorial, ICRC Colombia chief Christopher Harnisch reiterated the conclusions of his organization’s annual report claiming there are five armed conflicts in Colombia, according to international humanitarian law. State officials and President Ivan Duque‘s far-right party, the Democratic Center, have denied Colombia has ever had an armed conflict and have fiercely opposed the peace process with the demobilized FARC guerrilla group that began in late 2016. Harnisch told press additionally that violence and fear are on the rise in Colombia in a clear rebuttal of Defense Minister Guillermo Botero, who has denied the upsurge in violence in a letter to the United Nations. People have returned to fear, conflict is increasing. This worries us and we are calling for less indifference in the country towards the situations of people who are living in armed conflict. The government’s chronic failures to implement the peace deal has worsened the security situation in many former FARC territories because the state failed to impose the rule of law, the ICRC confirmed in its annual report. The chronic state failures, the consequential power vacuum and increased violence in many former FARC territories have “diminished hope” in the peace process, said Harnisch. With the departure of the FARC, a security vacuum occurred, in which the replacement of what could be called a de facto authority for the civilian population that should be protected by law was unknown. In this context, many illegal economies and conflictive dynamics surged that left the civilian population unprotected, and during these past months hope in regards to the process clearly diminished. The situation is particularly problematic along the border with Venezuela, the Red Cross said in its annual report, after millions have fled an ongoing political and economic crisis in their country. The situation in the country is now more complex than when the peace accords with the FARC were signed. Now the humanitarian situation is deteriorating and the conflict dynamics are merging with the vulnerability of migrant populations on the border. The ICRC supported its claim that that armed conflict is increasing with statistics. According to the humanitarian organization, almost 28,000 people became the victims of mass displacement in 2018, a 90% increase compared to the year before. The number of landmine victims increased 287% from 57 in 2017 to 221 last year. The organization urged the government to assume responsibility and control in the countryside. “Those who bear arms, for their part, must ensure that their members respect the civilian population and keep it away from hostilities,” the Red Cross said.